In the field of woodworking, besides skills and experience, even professionals need the specialized supportive tools for achieving the best results. Especially for expert carpenters who manage serious workshops, owning a miter saw offers many benefits and time-saving to create the perfect cuts and angles in your joinery. Among compound miter saws, the Dewalt DWS709 dual bevel sliding compound miter saw stands out with the high-end features, classy design, and very affordable price. It can afford the various requirements of your projects such as crown molding, window, door frames/casing, ... or even the extremely complex cuts. - Compound miter saws: This type of miter saw can cut complicated cuts but they can only tilt in one direction, some models can rotate up to 50 degrees. - Dual- bevel compound miter saws: Similar to compound miter saws, these units have the ability to rotate both left and right for bevel and compound cutting without flipping your workpiece. Among the various miter saws out there, what make the Dewalt DWS709 become different and special? The first thing to mention is the price. With a relatively high range price for the dual-bevel compound miter saw, this machine come with an affordable product, which is suitable for medium to big budgets. The next thing to love is the accuracy and high efficiency this machine provides. Moreover, it delivers high powerful 15 Amp, 3800 rpm motor which makes Dewalt DWS709 become a good- cheap- effective miter saw to choose. Extremely effective in cutting even the complex angles and bevels. The precise result with supportive detail parts. 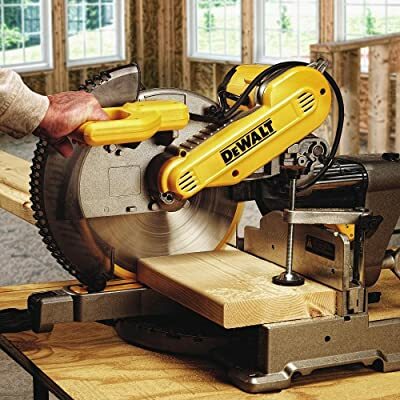 Dewalt DWS709 compound miter saw is really an affordable, easy to use and effective compound miter saw to own for your workshop. It enables the ability in creating nice workpiece cutting, handle your complex projects like scribe cuts, compound or bevel cuts. The biggest advantage is the high power and accuracy. This machine is powered by a 15 Amp, 3,800 rpm motor that delivers extra power and durability when operating. Moreover, the adjustable miter detent plate allows the user to quickly adjust the saw to maintain accuracy. This machine has up to 12 positions miter detents﻿﻿ that allow quick adjustment of the miter angle, improve performance and ensure accurate cutting to the angle and bevel you desire. Plus, the titer pointer is easy to read and miter angle. Besides, this machine has a miter 60 degrees to the right and 50 degrees to the left to increase the cutting ability. The large and easy-to-read bevel scale also assist control the bevel angle accurately. When the saw is beveled, the sliding fences can be easily removed to the exact angles. One more point that we really enjoy is the high sliding fence. This feature is great for crown molding up to 5-1 / 2 inches, nested and base molding up to 4-1 / 2 inches upright against the fence. The exclusive rear fence design can cut up to 2 * 14 lumber sizes at 90 degrees and 2 * 10 at 45 degrees. This advantage is also prominent even when you need to make small and details cut lines such as oak stair treads or handrails. If you're afraid of cheap machines, which are usually made of poorly crafted materials and fast to broken, then oppositely, the Dewalt DWS709 brings a solid construction and durability. The sturdy construction not only increases durability but also ensures that the machine is in a stable, vibration-free position even for heavy duty jobs, ensuring the highest accuracy of your products. With the base made of solid aluminum combined with tall ribbing to provide firmness and power to the machine when using. In addition, the stainless plates cover the pads ensure excellent durability. Not only the stable base design, the parts and details are also optimized to ensure the durability of the Dewalt DWS709. Especifically, the dual horizontal steel rails with linear ball bearings and precision miter systems are built to last for years and ensure that you are able to handle even the extremely complex cuts. We love that this machine has a dust bag to hold debris after cutting the workpiece. This means that your work space is kept neat and clean but not a messy place after working like using other types of saws. This saves a lot of time, you'll focus on the quality of your workpieces instead of worrying about cleanup. I love all about this product and have no complaints about it. The only thing I thought that might be the problem with someone is the price. Even though it is affordable but still a little pricey for some small budget or home use. Most users found out the similar and different features between the Dewalt DWS709 and DWS780 series. So, what is the biggest difference between them and which one is better? The DWS780 is able to handle the larger amount of heavy duty jobs requirements than the Dewalt DWS709 because it comes with extra features for extend capabilities. Especially, the DWS780 has wider scaling capabilities and integrated an additional XPS LED light and cross cut positioning system to provide additional cut-off without the need for calibration like lasers. However, this machine is heavier and bigger than the DWS709 few pounds and more expensive. That’s because it provides extra superior features and benefits to users. Therefore, the DWS709 is appropriate with the smaller budgets than the DWS780, which can save a few hundred dollars. Maintaining and cleaning the miter saw also contributes greatly to keeping it durable. Never forget to clean the sawdust, debris in the machine and parts. Next, store them in a cool, dry place. Most notably you should keep the saw blade clean after use. If you forget these maintain steps, the machine will be easy to broken and you will waste a lot of money instead of invest in caring them from the beginning. Make sure you use eye and ear protection when working with the machine. Keep your workpiece firmly in place while cutting against the fences. Make sure the machine is turned off and the blade has stopped before touching and remove the machine for repair or leaving the work area. For small, short workpiece, clamps or vice should be used to hold these in place. For the miter saw under $ 500 DeWalt dws709 this is really a great bargain. Not only have the advantage of power and performance, DeWalt also guarantees the satisfaction of warranty and customer care. If you are anxious to find a professional dual-bevel sliding compound miter saw to handle large projects required high accuracy, this machine is a great choice. You can also check the great portable generator Honda EU2000i review in case you need to use this miter saw when your work space is out of electric.